A bellweather snow road is finally closed. 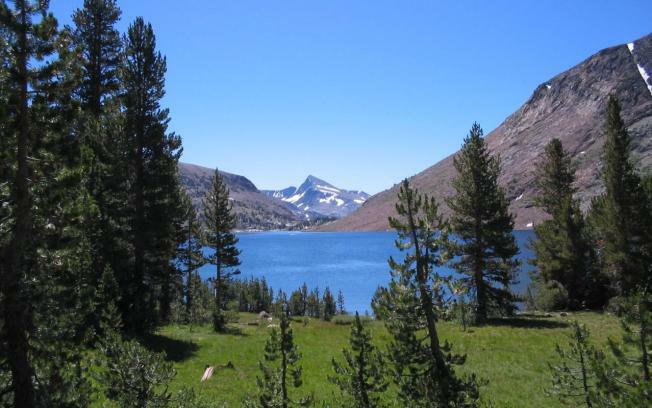 This is Saddlebag Lake which is located up the 395 past Mammoth Lakes at the Tioga Pass turn off. This lake is located above 10,000 feet. After an unusual winter with very little snow, officials at Yosemite National Park are finally closing Tioga Road, the highest crossing of the Sierra Nevada. Park officials were anticipating arrival of wet weather systems Tuesday night and were planning to close the road at 7 p.m. Rangers said that rain, snow and freezing temperatures could combine to make the road impassable. Tioga Road is the main entry to the park from the eastern side of the Sierra range. After record snow forced a late opening last spring, this winter's lack of precipitation has kept it open to one of the latest dates on record. Remaining open is Glacier Point Road, which leads to spectacular views of Half Dome and Yosemite Valley. It is usually closed by snow in the winter.